This work is the translation from Latin into Spanish, with comments included, of Cassianus Bassu´s work. Cassianus Bassu wrote Eclogae in the 6th century. Basically it is the collection in a single treatise of what several authors said about agriculture, plant care, seed and other useful things, and the Geoponica is one of them. His work was written as a compendium, based primarily on the Collection of agricultural practices by Vindanio Anatolio of Beirut and the Georgics by Didimo. This encyclopedic collection comprises twenty books and 621 chapters. It is a heterogeneous and entertaining work with plenty of peculiarities that had only been translated into a language as strange as Syriac. This work is basic to a better understanding of the history of early Greek and Roman cuisine. 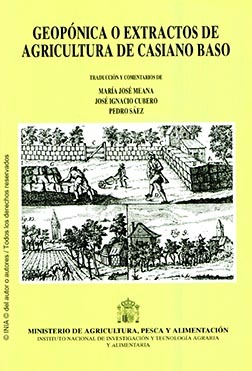 It is possible that many concepts accepted as correct by historians and students of cooking appear in a different light after reading this book, as it exposes in detail the development of many products, not only agrarian production but also about classic cuisine (for example, the formula to make “garum”, which was thought to be lost forever). Some of the topics covered in the book are weather forecasting and harvest soothsaying; traditional extensive agriculture (cereals, legumes, etc. ); the vine, wine and derivatives; orchard and garden; fruit trees; flowers and ornamental trees; how to get rid of pests or harmful animals, the breeding and care of livestock; use of wild animals; poultry; natural feelings and antipathies among animals, plants and minerals; bees; horse breeding and healing; dogs and hunting animals; salting; or fishing. Physical Description : 635p. ; 17x24. This book was added to our online catalog on Friday 28 November, 2014.